I visted Bangkok in mid June for 4 days then again at the end of June for 4 days. My first visited I enjoyed but the second time around I loved. The first visit we had just a started our travelling adventure, we where overwhelmed, jet lagged and a bit uneasy about the whole 'we have just left our families for a few months' situation! We managed to see and do a lot more he 2nd visit so we had a much better experience. It rains! Not a light drizzle, full on monsoon! We soon realised that it is not a good idea to try brave it and run out in it as you will get soaked, and you wil then spend the rest of your day wet. If you can fit an umbrella in your bag do ! It is also very humid and takes a few days to adjust. We where sweating when we arrived but we learnt to find the air con or fans in the bars. There is no shortage of various hotels and hostels so there are plenty to choose from. We choose the Top Inn on Kho San road for our first visit. This was quiet hard to find when we arrived and the taxi driver didn't know where to go. We ended up asking loads of people eventually to find it was off the street and down a sort of alley. It was a nice enough room, very basic but great value for money (I think we paid £9 for the room per night) it had a bathroom, air con and a TV. The downside was we where on the 4th floor so it was a long treck up with our bags, and the wifi didn't reach our room. Also, we left the air con on while we where out, to keep the room cool for when we got back in an the cleaning staff would turn it off so we came back to a sauna which was not nice ! Our 2nd visit the hostel was a lot more modern. we where in a shared dorm but it was nice enough and really clean too, plus breakfast was included. 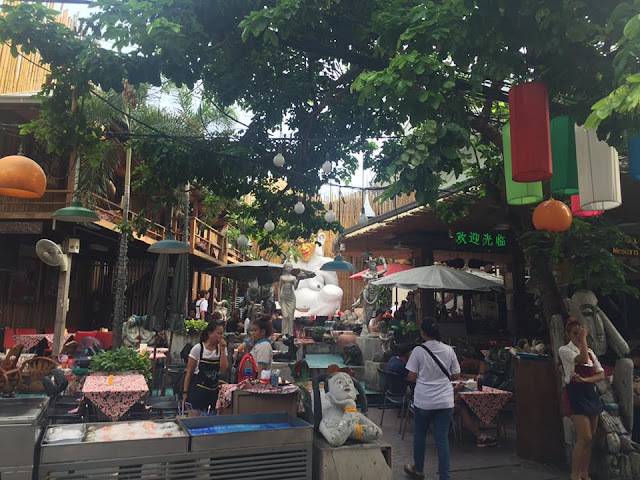 Bangkok and Kho San road in particular is party central and packed with tourists. Everyone is trying to sell you stuff or get you in the bars and restaurants - very annoying but you learn to just ignore them or say no thanks. There was a surprising amount of Thai party goers which I preferred. Most of the bars are nice enough however they get very aggy with you if you go to the toilet before sitting down for a drink ! (Ended up in a big argument with a lady boy) or if you are in the bar dancing and you don't have a drink ! (Again big argument) But apart from that it's fairly okay. On our last night we decided to embrace the rain and just dance in the street with lots of other drunk people - such a good experience but also a soggy one. I found food here a bit odd. I really wanted authentic food however down Kho San road it was either street food, a mixture of Thai and English in the bars or snacks from the 7-11 shops. It was often to hot to eat and we had some strange combinations including a packet of crisps for tea one night and a dodgy street cart pad Thai when we where drunk at 1am. We did enjoy some nice meals in the city centre which my friend Gail (who is Thai) took us to. 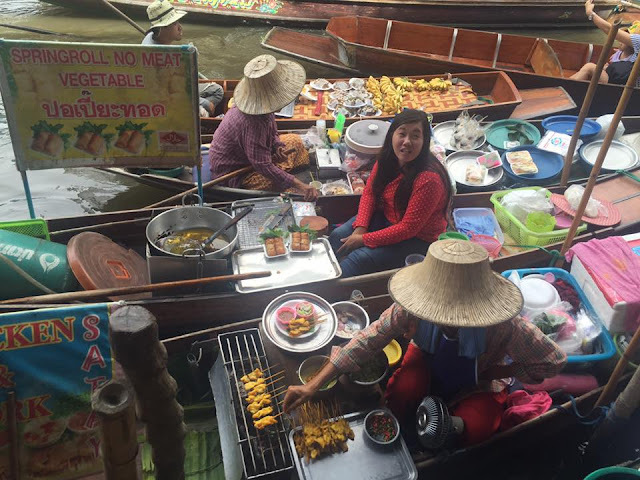 We tried some street food at the floating market which was really nice and would defiantly recommend you trying if you go there. We mainly got taxis, it is best to haggle the price or you can ask for the metre price. We found the metre was cheaper but they often argued to not use it. We also tried out the tuk-tuks which where great fun! Another method we used was the sky train, which was just like a tram or the London under ground. Fairly easy to use and pretty cheap too. Finally we tried out the tourist boat which was fairly cheap (Less than £1 each journey) which took us to the palace and to china town. The first time we went to Bangkok we only managed to visit the Wat Pho which is the temple of the reclining Buddha. This was a great experience and was really interesting to see. We paid 100TBH entry which included a bottle of water. On our second trip we also visited the Royal Palace which was amazing (& huge) , We had a quick look around China Town, we visited the standing Buddha and the Lucky Buddha and we went to the floating market which is outside of the city centre. We also explored the amazing shopping malls. If you are on holiday rather than back packing I would leave room in your suitcase as there is so much to buy in the amazing stores. There was a crazy amount of food outlets here too so make sure you choose a good one. We explored a lot of the local area, found the road next to Kho San was a lot more chilled and less geared up for tourists and partying. On our second visited we stayed away from Kho San just as we wanted to do a lot more exploring and less partying. We also visited the cinema ! It was really cheap so a good alternative to partying.